In the fall of 2001, eight months after I arrived, a man from the first parish I worked in came for a visit from Philadelphia. Woody was a wonderful churchman who attended the early Sunday service at The Church of the Good Shepherd to make his Communion, and then had to rush back downtown to be the audio engineer at a Presbyterian church. He has a long, interesting spiritual journey that was deeply grounded in the Sacramental Theology of the Church. A sacrament is “an outward and visible sign of an inward and spiritual grace given unto us; ordained by Christ himself, as a means whereby we receive this grace, and a pledge to assure us thereof” (Second Office of Instruction from the Book of Common prayer, p. 292). Baptism and Holy Communion are the two primary sacraments among the seven generally recognized by the Church. Last week we were graced to have a baptism, and today we are celebrating in a special way the gift of Our Lord giving Himself to us under the species of Bread and Wine. After some time in prayer in our chapel, Woody said to me, “what a perfect place, with the decoration behind the cross, for the Service of Benediction.” I had to break it to him that although St. John’s was quite advanced in her Churchmanship we did not have a Monstrance, the device to adore our Lord in the Blessed Sacrament, in order to have that service. Two weeks later this arrived in the mail, a sacrificial gift from a friend living far away geographically, but close in heart every time we have Benediction (scheduled Thursdays after the 10:30 service, and on special Holy Days). 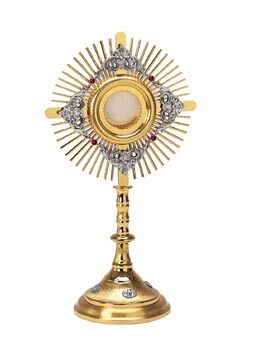 Jesus Christ is present in His the Holy Sacrament. Let us “eat His flesh and drink His blood” (John 6), and adore and give thanks for that blessing given to us.